St. Francis House chef Seth Green (top) is aided by (left to right) Alberto Maria, Bob Hurstak, and Gerry McDermott. Imagine cooking about 600 meals a day, seven days a week, 365 days a year. What would it cost? How many people would be needed? Now imagine doing it with just three staff members and a daily budget of about $550. Impossible? No. Miraculous? Maybe. Difficult? Definitely. It is a feat Seth Green, head chef at St. Francis House, a daytime refuge for the homeless and poor in downtown Boston, manages with culinary creativity and penny-pinching mastery like most home cooks could never imagine. And it is a job that grows ever more challenging as the number of people who rely on St. Francis House expands. Last year, the shelter served 6,500 guests, including 2,700 who were there for the first time. Just about everything – from the 140 pounds of salmon used in last week’s Coconut Lime Crusted Salmon to the 120 pounds of ground beef and turkey for this week’s meatloaf – is donated from places such as Lovin’ Spoonfuls in Brookline, the Greater Boston Food Bank, or Pret a Manger, which donates mixed greens to round out a meal. “I think I spent $7 this week on drinks for the volunteers and a soda for the fat chef,’’ joked Green. His creative thriftiness allows Green not just to feed scores of people each day — but also to feed them remarkably well. Take Tuesday’s lunch of Seafood Cioppino, which will include clams and squid that he’s buying. And nothing goes to waste. Green bought several tomato scoopers, for instance, to save the tops of tomatoes when removing the cores. Leftover chili from one meal is used to flavor American Chop Suey for the next. But prepping a tasty, home-cooked meal on a shoestring budget is about more than counting dollars and cents. Green essentially opens the cupboards and looks in the freezer, albeit an industrial sized one capable of holding ginormous amounts of food, sees what’s inside, then figures out what he can make. It’s a style of cooking, Green, 52, learned from his grandmother, who he said threw stuff in a pot and tasted it. If it needed a little something else, more stuff was tossed in the pot. So when he sits and writes recipes, it’s usually just a list of ingredients without quantities. “If you don’t know by now, you don’t belong in a kitchen,’’ needled Green, who’s been in the business 30 years as a head chef in a resturant, cooking for weddings at a resort, and as the food services director at a nursing home. What they both agree on is that no job has ever been as rewarding as this one. No one is refused a meal at St. Francis House, which also provides shelter, job training, and counseling services to those in need. 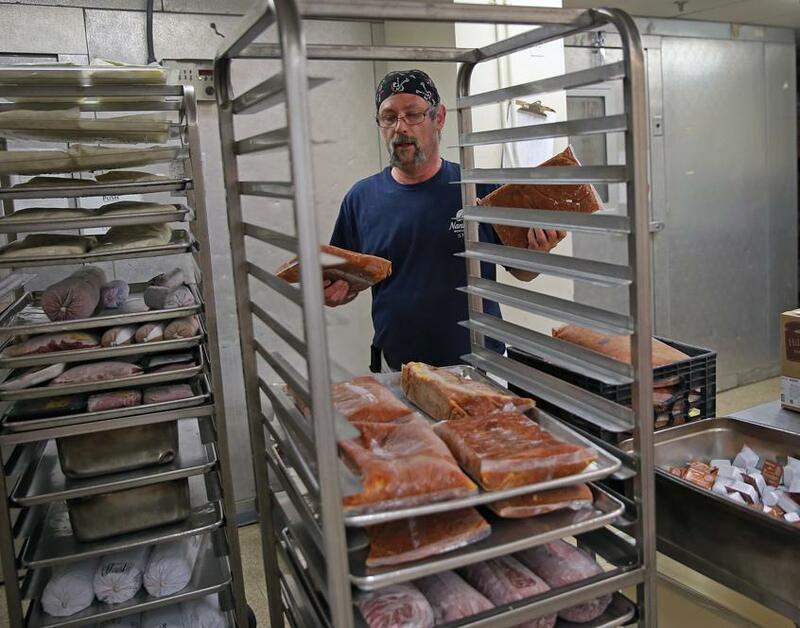 Founded by St. Anthony Shrine in 1984, food — and a loving conversation — has been the cornerstone of St. Francis House since the beginning, said Karen LaFrazia, the shelter’s executive director. The guardian of St. Anthony’s Shrine noticed homeless men and women spending their days in the sanctuary once night shelters closed their doors in the morning. “They would be looking for a meal, a cup of coffee, and someone to talk to,’’ LaFrazia said. And so, St. Francis House, near the Theatre District and Chinatown, was born. But not everyone who comes here is homeless. About 25 percent of the guests are working men and women who don’t make enough money to pay for rent, utilities, and groceries, she said. In many ways the work that goes into a simple meatloaf meal is similar to what happens in your mother or grandmother’s house. 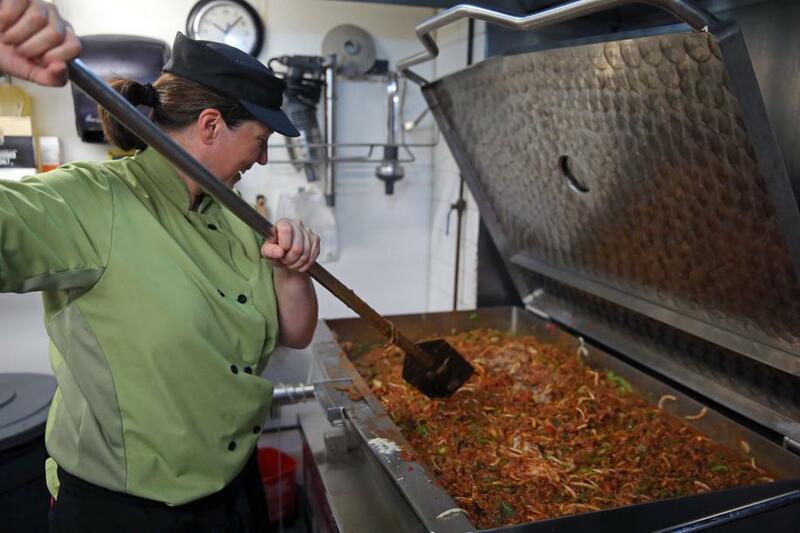 The onions and peppers are chopped, bread crumbs are mixed in, and it’s shaped by hand. Very little here is packaged or processed. But the food must be lovingly prepared with speed. The kitchen staff has 2½ hours — max — to make hundreds of meals, which is why a legion of volunteers is employed to help feed the multitudes. 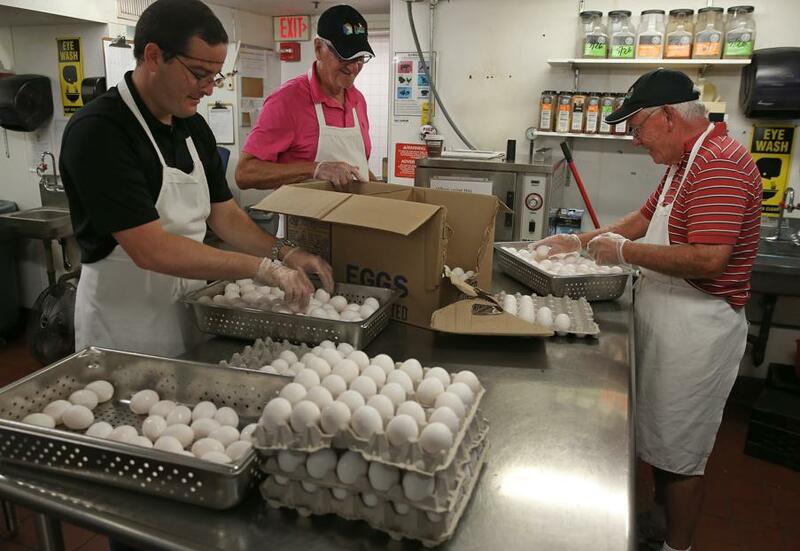 The volunteers — anywhere up to 15 on any given day — are used for prep work so Green and Stewart are freed to cook. He can chop up to 100 pounds of the tear-inducing vegetables in two hours. “They make us cry anyway,’’ he quipped about Green and Stewart. “I always said, ‘If I haven’t made you cry my day is not complete,’ ’’ Green chimed in as the kitchen crew cleaned up after the day’s lunch. Eaton said he started volunteering two years ago because “the idea of feeding the homeless felt very noble.’’ He returned because he liked the people. There are days, though, when volunteers don’t show. In those instances, Green has a go-to list of volunteers to back fill his schedule. But sometimes it’s just him. But he’s sure there will come a time when it will happen again — and he’ll be there. He’s slept at the shelter during blizzards to make sure guests have a hot, home-cooked meal when the doors open in the morning.